We live a mobile lifestyle. Our mobile devices keep us connected, and we can do anything from our mobile devices – from anywhere in the world. Online banking, hotel reservations, email – all can be accessed with a tap of the finger. If you forget your phone at a restaurant, at work, or anywhere else unattended – how confident are you that nobody else can access your information? This is your first line of defense. If someone wants to access your device, they will first need to break this code. This is not an easy task, and can operate as a deterrent against theft. Some device manufacturers have an option to automatically wipe your device after a few unsuccessful attempts at your passcode or pin; so, even if your phone is stolen, your information cannot be accessed. There are thousands of applications out there, and many involve more than just crushing candy or shooting birds at pigs. Certain software can help you locate your lost or stolen device through its GPS. Apple offers a service like this for their mobile devices aptly named Find my iPhone. For Android users, the Android Device Manager offers these services. Windows Mobile users also have this option from the Windows Phone website. Similarly, many third party applications are available in each of the app stores. Utilizing an Antivirus and Malware scanner is never a bad idea. Your phones are mini-computers, and just like your “big” computer – they need to be cleaned up from time to time. 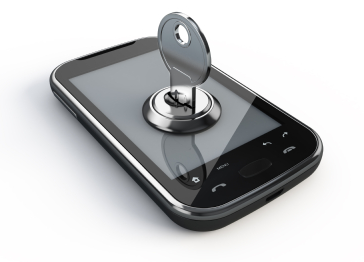 Malware and Virus threats can compromise information stored on your mobile devices. Malware has a snowball effect, and can continuously pile up until it slows downs or stops your device. Look for an MSP that offers Malwarebytes as a solution to this problem for both mobile devices and computers. It will keep your end points clean and secure from outsiders. Consider Webroot as an antivirus application that scans your downloaded apps and devices for any threats. Equipped with internet security, this defense will give you a heads up if it detects any malicious activity from your device’s browser. In the end, the number one security measure on your mobile device is you. Be proactive. Protect yourself and your information using the steps above!